Recently, Bandai Namco uploaded a new trailer for the latest entry of the Tales of franchise, Tales of Berseria demonstrating some of the dub work in the beginning of the game. People were quick to note that one of the pivotal scenes in the prologue was altered and toned down. Bandai Namco has come out and responded to the censorship allegations with a Facebook post today, which you can read here. 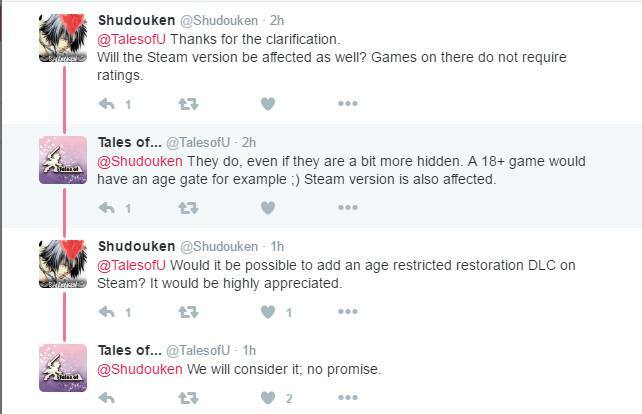 Essentially, they claim it boils down to age rating as the original scene would deem it not possible to have an age rating of PEGI 16 which in a business sense they would want to avoid. They also refer to the original interview with the game’s producer that claims the game would come over uncensored but instead it was referring to Velvet’s outfit — which will remain the same. Finally, this will be the only scene altered from the original Japanese version of Tales of Berseria as stated in the response. When asked on their twitter about other regions being affected, they confirmed both North American and European version will have the same edit, as well as the Steam version. Another question was the possibility of a DLC patch for the Steam version to return the scene to its original form, in response they said “We will consider it; no promise“. So its nice that they were transparent about this, how do you feel about the change now? Do you think it was justified or are you still on the fence? Please share with us your thoughts on the matter below.